BOOK THE VILLA COLLINA DEI FIORI 6 in MAY and JUNE AND YOU WILL GET A FREE WELCOME BASKET with a small shopping for the dinner, and breakfast for the next morning. 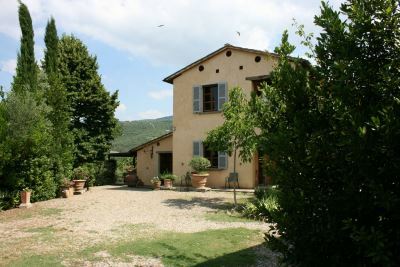 COLLINA DEI FIORI 6 is a typical country villa in a panoramic position surrounded by olive grove, near by Castiglion Fiorentino, reachable with a short walk. The Villa offer a private Pool, a tennis court and outdoor spaces to relax and enjoy the view. GROUND FLOOR: Entrance from a porch, living room, kitchen-dining room with fireplace, bathroom with shower, twin bedroom. FIRST FLOOR: with access from internal staircase, double bedroom with small panoramic loggia, double bedroom, bathroom with shower. EQUIPMENT: dishwasher, washing machine, oven, iron, fridge with freezer, high chair, radio, toaster, filter coffee maker, satellite-Tv, tennis court, table tennis, playground for children, barbecue, shaded car spot (2), Wi-Fi Internet access, hairdryer.